Are you planning on hosting or participating in an outdoor event where you’ll be advertising your products and services? 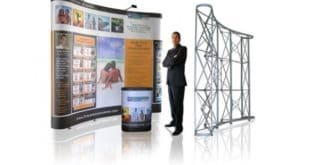 If yes, then using a large mesh banner for your display signage would be a great way to catch the eye of attendees and improve your ROI. Mesh banners are made of a vinyl material that has perforations all over to allow air to pass through. With mesh banners, you can print stunning graphics and illustrations on a breathable material that can withstand harsh climatic conditions, says New York Banners, a reputed service for mesh banner printing in NYC. Vinyl banners look great and are highly durable. But, mesh vinyl banners offer some additional advantages over regular vinyl. They’re great for both windy and wet weather. They’re more durable, while also being lightweight. In case of banners made of regular vinyl, a slit is cut into the banner so that the wind can pass through it without damaging it. This decreases the stress on the banner and prevents it from toppling over too. The cut is usually made in the form of a semi circle in order to create a flap. The flap opens when the wind blows on the banner and the air can pass the opening. Wind slits or mesh banners? However, wind slits have some clear disadvantages, when compared to using mesh banners. The single opening created by a wind slit allows only a small amount of air to pass through. So, the reduction of air pressure on the banner is much less with wind slits than with mesh. Also, using wind slits would result in a disruption of the graphics during windy conditions. This will obviously lower your display’s impact on the viewers. Buildings: Mesh vinyl banners are lightweight, which makes them ideal for installation on a large scale, such as on buildings, for advertising new products and services. Outdoor Events: These banners are a great choice for advertising outdoor events, such as promotional sales, store openings, sporting events, school presentations and exhibitions. Concerts: Mesh banners can easily catch the eye of the captive audience at outdoor concerts. The banners at such events usually include information about the event, the sponsor logos and some decorative artwork. Construction Sites: What better way to cover an unsightly construction site than with attractive banners? The vibrant banners can be a great way of getting everyone excited about the building that is under construction. Sporting Events: The large sponsor banners that can be seen on the fencing at sporting events, such as football and car racing, are generally made of mesh vinyl. Mesh banners can be a wonderful solution for all of your outdoor signage needs. They’re attractive to look at, highly durable and quite affordable. However, when you get large mesh banners printed, make sure you choose an experienced and skilled printing service for best results.